Back in July, 2009, Neil MacGregor, director of the British Museum, and Sir Nicholas Serota of the Tate made some real waves in both the gallery, museum and broadcasting world by suggesting that the future role of the public museum and art gallery would be as online publishers and broadcasters. Despite the slightly forgotten fact that the remark was made as a response to a question from the clearly impatient Bamber Gasgoigne who wanted to know just when they were going to start talking about the elephant in the room - online - both Neil MacGregor and Sir Nicholas definitely took the moral high ground as clear thinking visionaries who knew what was what in their respective domains. Go here - and scroll down to July 2009 - for the video of the session from the LSE. However, since then the notion of gallery and museum as broadcaster doesn't seem to have made much practical headway. At least, until now. Two examples - one from the UK - one from nearer home here in New Zealand, offer some interesting examples of the process in action - and while they are at it - a useful benchmark to the potential different styles of approach. 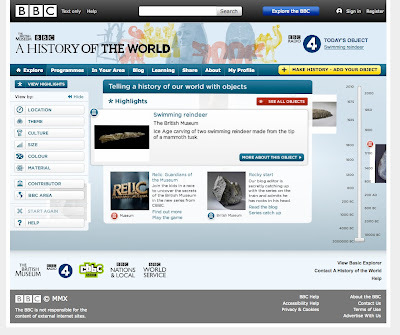 The first example - see the image above - is a co-production between the British Museum and the BBC. Written and presented by Neil MacGregor himself, who also choose the objects. The scale of the project, as well as the reach of the intent to cover as many online touch points is impressive. Thus the core of the broadcasting end of the project is a series of 15 minute radio spots, web presence - and a series of spinoff activities - both in the museum and back on the BBC. Over on the BBC web site - the 100 Objects web site offers a podcast and archive to the programmes, a write up of each object from the British Museum collection - a series of photographs of the same, [zoom-able and tagged with labels] plus a set of contextual maps showing both the objects provenance and its place in the world. There is also a blog, plus a bunch of other tools - including a widget and RSS to the series. I've embedded the widget to the side of this blog as an example. So far - this Friday - they have got to the fourth of 100 programmes. And it will take to the end of the year to tell the whole tale - nothing less than the history of humanity in 100 objects. On the British Museum web site there is an equally impressive parallel world of the objects and the activities that they have put together to support the project. They also have their own online touch points. I like this project. I especially like the idea that the broadcaster - in this case the BBC - and the institution, the British Museum - have used different tools and spaces to bring to the front their different ways of considering the objects as a broadcast series, and as a collection with its own pedagogical methodology. It also gives each party a chance to showcase their core activities/competencies - in the one - bringing the context of the museum to the objects, and in the other showing how good radio needs its own methodology and skill set. In short, if galleries and museums want to be broadcasters, then they need to work with the best to find out just what's involved! The project has also gone out to other regional UK museums and got them to play the 100 object game by putting up examples from their own collections. See for example this beaker from my home area, in East Lothian, here. And of course, who would doubt it - there is the obligatory BBC nod to crowd sourcing asking people to upload their own objects and so join in the dance. Curiously, try as I might to engage with this, there is something about the BBC crowd sourcing experience to date - perhaps it's the language they use - that always reminds me of a plumy voice asking people to write their answers on a postcard in their best writing. But I digress. The project is a fantastic effort from all parties. And the amount of work involved from all departments is phenomenal. I also think Neil MacGregor deserves a big round of applause for writing and presenting the programmes. 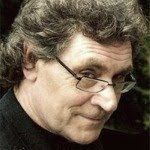 You can hear his commitment - and indeed his scholarship, and it will probably do more to enhance his notion of a world museum than any amount of papers and journal articles. All that said, it's going to be interesting to see how the project keeps up the energy - whether it be through in house events and programmes, or the ongoing work on the different web spaces. Curiously, its the broadcasting end of the project that makes me think the energy will endure. Broadcasters, especially the likes of the BBC, have both the skill set and the track record to understand that programming over time and distance needs a lot of planning, and that new energy, and new directions, need to be injected at different parts of the project cycle. It will be interesting to see how that works in this instance. In the meantime, I definitely recommend a visit to both the BBC site - and the British Museum. My other example, Tales from Te Papa, is a co-production between TVNZ6 - a local public service digital channel here in New Zealand and the Museum of New Zealand Te Papa Tongarewa , aka Te Papa. The series of mini-documentaries showcase some of the objects in the museum, and is presented by Simon Morton and Riria Hoter. The emphasis is again on story - and the belief that each of the objects has something to say about the culture and history of New Zealand as well as offering touch points to science and exploration. Apart from their enthusiasm for the task [albeit a little overwhelming at times] the presenters have done a great job in bringing out the talent and commitment of the curators and researchers to the objects. There are 50 reports from an albatross from the storm that sank the Wahine, art from Colin McCahon, early dental clinic chairs, and deep sea fish. Again, I like the energy behind this project. For sure, its different to the BBC - British Museum project - much more instant and episodic, without the slow roll of the long reach of history that characterises the 100 Object project to date. Moreover, there is lot more to be said - and discussed - on how the two projects explore the idea of a museum and its contemporary place in the world. The British Museum, especially the voice of the director stamps real authority on the project - whereas the Te Papa project seems more intent on grabbing the attention of the viewer and making sure that are given a few cultural vitamins. It would be good to see, or hear of other examples of the broadcasting gene in action the better to explore this continuum? Co-incidentally I downloaded the first pod-cast from this BBC site yesterday, and listened to it on my way to work this morning! It reminds me of listening to serials on the radio before TV in NZ. People asked what did you look at when you were listening? I'd call it the inward creative eye. A good pod-cast combines this ability to visualise the object through words, AND you can go to the site and see the thing! good work bringing it the peeps Paul.